An article comparing the new PMI agile certification to the other agile PM certifications in the marketplace. There’s lots of buzz in both the project management and agile communities recently with the announcement from PMI that they are launching a new agile certification. 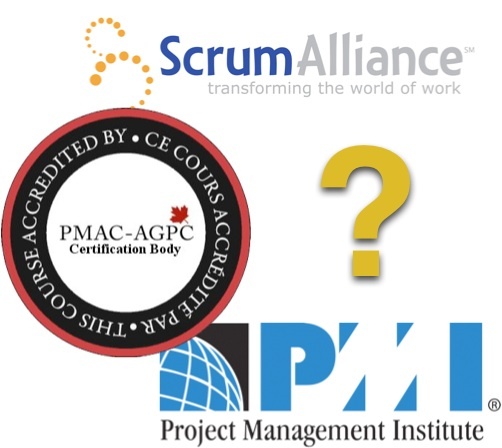 Questions abound: what are the PMI agile certification requirements, how does this compare to the Certified ScrumMaster (CSM) or Certified Agile Project Manager (Cert.APM) qualifications, when can I apply, and many more. PMI has provided some guidance on the process and requirements, but much is still currently unannounced as they are finalizing the details. A pilot certification round is starting imminently with a full rollout this summer – the exam should be fully available through Prometric Testing Centres in September 2011 with the application process starting in May or June. In the mean time, Internet discussion boards and chat rooms are filled with speculation. What we do know for sure is that to become certified, you’ll need to pass a 3-hour multiple-choice exam on agile management with 120 questions, of which only 100 will count towards your score – the other 20 are experimental questions being considered for future exams. The exams will be available via computer or paper at Prometric Testing Centres, the same as the PMP or other PMI exams. For educational requirements, you’ll need to complete a minimum of 21 hours of agile-specific training in addition to having a basic high-school diploma (at a minimum). So, if you are CSM who has just completed the basic 2-day Certified Scrum Master course, you’ll need to go out and get an additional day of training. This is probably a wise thing to do anyway, as the exam will cover a lot more than just Scrum practices. For example, the sample questions that PMI has on their web site includes questions from Extreme Programming (XP) and Scrum, plus many questions that are outside the scope of pure Scrum, such as the construction of release plans. There are also experiential requirements. A candidate must demonstrate 2,000 hours of working on project teams in the last five years (not necessarily as the project manager – just working in a project environment), plus 1,500 hours of working on agile projects in the past two years. PMPs will skip the 2,000 hour requirement, but must still meet the 1,500 hour requirement. This agile experience presents a significant hurdle that will prevent many people (including new CSMs) from earning the PMI certification. It is not just a test of agile knowledge, but rather you’ll need to demonstrate experience as well. Initial observations show that the Certified ScrumMaster credential is not on par with the other two certifications. Not only does it have low-to-nonexistent educational and experiential requirements, but its exam is not credible if everyone who attempts the exam gets their Certified ScrumMaster designation even if they don’t pass the exam. The CSM credential is offered by the Scrum Alliance. They state right on their own web site: “Once you have completed the evaluation you will be granted Certified ScrumMaster status regardless of your score. If you score poorly, however, you will receive feedback detailing where you are deficient and what resources you should study to improve.” The CSM certification was criticized in the past for not having an exam at all – this new approach does not make much of a difference if you get the certification even if you fail. On the strength of this last point alone, those interested in agile certification should focus on the other two options. Overall, the new PMI agile certification compares favourably with PMAC’s Certified Agile Project Manager. Both require 3 days of agile-specific training, both require about a year of project experience, and both have a multiple choice exam (though PMI’s is longer). The key differences: PMI’s exam requires agile project experience (which may exclude many potential candidates) and it is much more costly to obtain (almost five times more expensive) and more costly to maintain. Still, with the marketing might of PMI behind the exam, it should quickly catch on. Those interested in obtaining agile project management certification should put acquiring the new PMI agile credential on their long-term career development plan. In the short term, the Certified Agile Project Manager credential from PMAC is a great interim step. demonstration of the necessary soft skills through a face-to-face interview. With all of these elements, it is clear that this last certification is more costly and time-consuming to achieve. However, it is clear that the Certified Senior Agile Project Manager credential is the gold standard of agile project management certifications.